I am back from my last week of vacations for this summer (photographs will follow) and I feel kinda sad. In two weeks from now, schools are starting and we will be back to our winter routine. Summer is over and with it those long, lazy, out in the open days. This makes me feel a bit melancholic and depressed. I like winter and all the celebrations it brings with it, but summer has a unique magic especially in this country. Summer is so full of life, full moons, swimming, sunsets, beach walks etc. that are very hard for me to let go. Anyway, as we say, if you cannot change things just sit back and enjoy. For the end of August and summer, I am giving you the recipe for a very fine and tasty Greek meze. 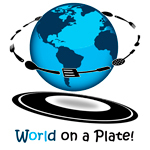 When Pola from World on a Plate told us that the theme for this month was stuffed vegetables, the first thing that came to my mind was stuffed tomatoes and peppers (Gemista in Greek). But then I thought that, this is something everyone knows and makes one way or another. And then, when I went to the supermarket, I saw these beautiful zucchini blossoms and I immediately understood that they were there for some reason. Their mission was to become a beautiful appetizer full of Greek flavors and my submission to World on a Plate for this month! 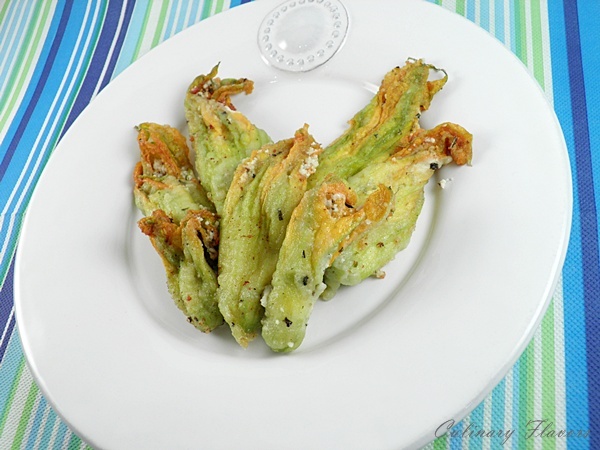 Zucchini blossoms are very delicate and they have to be treated with care and love. These blossoms are stuffed with feta cheese. In Greece we stuff them with rice and ground meat too. Either we fry them as in this case or we bake them. In any way we make them, they taste deliciously and it is the perfect appetizer during warm, summer days! This recipe is so easy and delicious you cannot believe it! Wash carefully the blossoms and remove the stems. Mix feta, milk and herbs. Stuff the blossoms and close them carefully. Put them in the fridge for half an hour. Make the batter by mixing water, flour and salt. In a pot pour olive oil and put it in high heat. Bath the blossoms to the water/flour batter and let them drain. When oil is hot, fry them until they become somewhat crispy. They can be eaten warm or cold as well! Πλύντε προσεκτικά τους κολοκυθοανθούς και βγάλτε τους στήμονες. Ανακατέψτε τη φέτα, το γάλα και τα αρωματικά. Γεμίστε τους κολοκυθοανθούς και κλείστε τους προσεκτικά. Βάλτε τους στο ψυγείο για μισή ώρα. Φτιάξτε το χυλό ανακατεύοντας όλα τα υλικά. Σε μία κατσαρόλα βάλτε ελαιόλαδο και ανοίξτε το μάτι στη μέγιστη θερμοκρασία. Βουτήξτε τους κολοκυθοανθούς στο χυλό, τινάξτε λίγο να στραγγίσουν. Ρίξτε τους στο καυτό λάδι και τηγανίστε για ένα δυο λεπτά μέχρι να γίνουν λίγο τραγανοί. Just desire to say your article is as surprising. The clearness to your publish is just spectacular and i could think you are a professional on this subject. Nice you could find these beautiful blossoms at the supermarket. 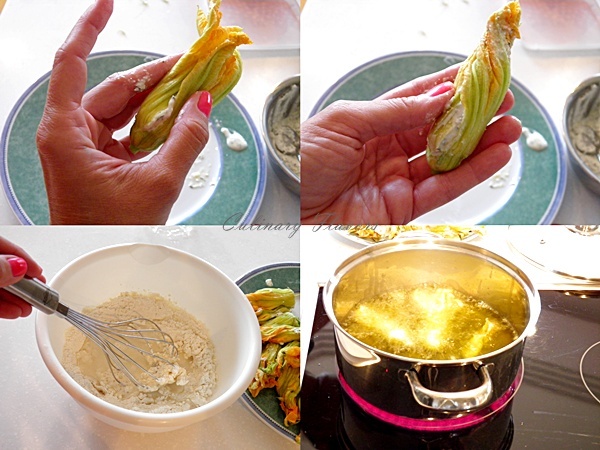 I’ve always wanted to make stuffed zucchini blossoms, but they are very hard to find around here. These look so good! I’ve always wanted to try doing this so I very much appreciate the inspiration! Yours look beautiful and SO delicious! I am so sad to see summer go too but I do love the fall. I hope your son has a happy new school year:) These look wonderful. I love the flavors you have used. They must be delicious. Hola amiga cuando llegue el verano haré esta hermosa receta luce muy exquisita seguiré tus pasos,abrazos hugs,hugs. I keep meaning to source these out since tasting them at a local place, they were awesome!! Yours look truly fantastic, i’m inspired! I have never eaten squash blossoms, but would like to give them a try. These look delicious! These look so delicious…I would never think of eating the zucchini blossom, but I have an Italian girlfriend who I give my blossoms to, in return she brings me a few fried blossoms! Beautiful, Katrina! I never can bring myself to pick the blossoms. Pick them after the zucchini has formed. These are just gorgeous – very nice! Your stuffed zucchini flowers remind me of that! Wow! I can almost imagine how good they must taste with the mint! Now I want to make some! What an interesting & unique recipe! 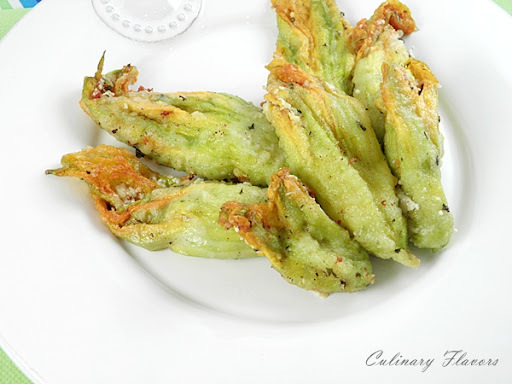 I have never seen zucchini blossoms before, but this look so tempting & delicious! Your zucchini blossoms look absolutely wonderful. And yes, there is something special about summer, isn’t there? I love fall; otherwise, saying goodbye to summer would be very painful! WOW!!!!!!!!!!!!!! I am SPEECHLESS!!! this is divine! bravo katerina!! I’ve never eaten zucchini blossoms before, but why not? This is a delicious idea!! I’ve only eaten these in Italy….and that was decades ago! But I remember how much I adored them…even though I have no recollection of the filling. I haven’t seen zucchini blossoms locally, but I will check our farmers’ market. Yours sound incredible!!! Des beignets de fleurs de courgettes qui se font beaucoup dans le Sud de la France. C’est très bon. Je note ta version. Il est toujours très difficile de laisser l’été derrière soi pour entamer une nouvelle année. Je n’aime pas beaucoup l’hiver non plus. I love the addition of spearmint in the stuffing. I always grow it but rarely use it and I love it. Perfect dish! What a lovely dish, don’t think I would have a chance to taste zucchini blossoms as they are not available here. Am sure they taste delicious! I love these stuffed zucchini blossoms, but never made it myself…yours look delicious with the feta cheese and a hint of mint…YUM! I’ve never made zucchini blossoms, these look delicious. Look forward to reading about vacation. I think if we’d ever seen summer here in Seattle, Washington I would be depressed to see it go. I’m simply sad we didn’t have much of a summer. Oh well, I love the smell of fall, it’s such a wonderful season too. I’ve never attempted zucchini blossoms. You’ve inspired me to give them a try. This makes me sad ’cause I haven’t been able to find blossoms yet this year. They look crazy good Katerina! They look delicious! I’ve never had the blossoms, I need to grow zucchini next summer, I’d love to try them stuffed. these look so beautiful and sound so delicious! 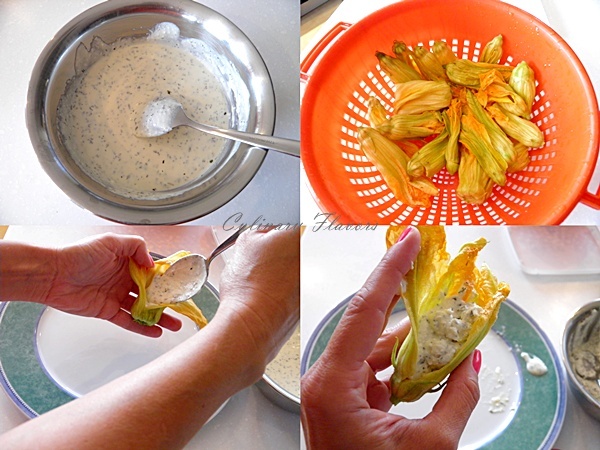 I LOVE fried zucchini blossoms and it looks like you’ve prepared them just about perfectly! I ve never made these – I cant find them here, but its really good and delicious! Yours looks amazing! 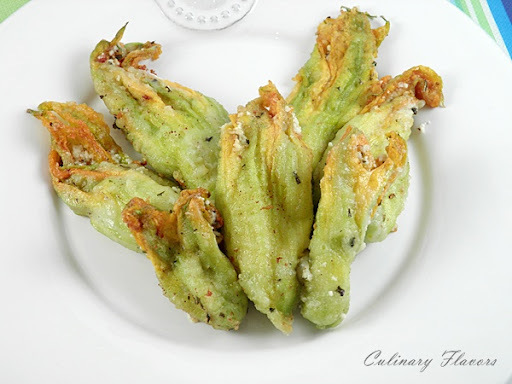 I have never tasted zucchini flowers but the filling and the preparation make it look really appetising. Katerina, what a beautiful creation this meal is! I love all the simple ingredients. Great food is simple and it tastes fantastic. Thank you for reminding us about it. We started school a week ago, and I am still adjusting to the early morning wake ups, and trying to fit my schedule into my son’s schedule. After this comment I am driving him to the gym for a workout, and will be running myself… Well, there are some benefits too. I’m sad that summer is coming to an end too, Katerina but, it isn’t over yet!!! 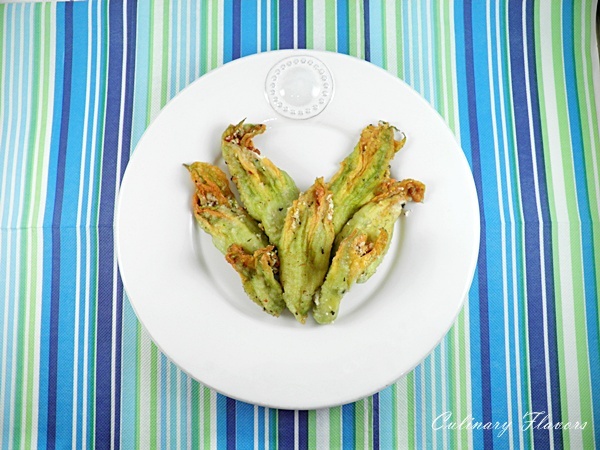 What better way to “toast” the bounty of summer if not with glorious stuffed zucchini blossoms! I love that you put Feta in them. I learned something else visiting today, I had no idea zucchini blossoms could be baked!!! Part of me feels bad that your summer is over, part of me is jealous you had a summer! Το φαγητό αυτό είναι από τα πολύ αγαπημένα, βέβαια στην Αθήνα σπάνια βρίσκω ανθούς αλλά όταν είμαι στο χωριό γυρίζω τους κήπους της γειτονιάς και τους απολαμβάνω με πολλούς τρόπους. 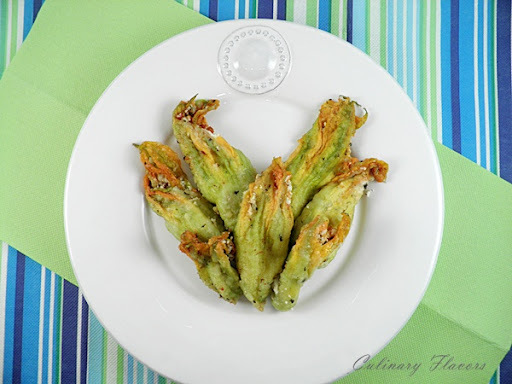 I made fried zuchinni blossoms last year when we grew zuchinis in the garden. I didnt stuff them though and I can’t wait to try them this way! They do look beautiful and elegant. Stuffed zucchini blossoms are such a lovely, elegant dish. They look really gorgeous, Katerina! I don’t see zucchini flowers in our grocery stores. These stuffed zucchini blossoms look delish. That looks like a delicious dish to me. I have never heard of this and would love to try it out. I also feel kind of sad when I am thinking about end of summer… But in Greece you have still all September of good weather! We are on the same page this month my friend! I also figured everyone would be making stuffed peppers, but no 😉 I love your Greek version of the stuffed zucchini blossoms – I will have to try them this way next time! Katerina mou, I just love this recipe, it;s the way my mom cooks them. I would like them with a cold beer in the table! Stuffed Zucchini looks yummy…Loved the stuffing of feta..
That looks like a delicious looking stuffing!